I just received the four new American Apparel shades I ordered and naturally, I'm in the middle of 3 projects I need to have finished up in an hour so I don't have time to swatch them all! My curiosity will have to wait on the other three, but I just had to see what Army Jacket looked like. The three photos below were all taken outside, the first under cloudy skies, then partly cloudy skies, and the last one is under full sun. Below: Here's a quick bottle comparison with Essie Sew Psyched. Similar shades, but in no way dupes. My order arrived quicker than I expected and they were all packed very well. As with the majority of American Apparel polishes, this one applied very nicely and I used 2 coats. Actually, I think it applied even better than previous ones I've swatched. 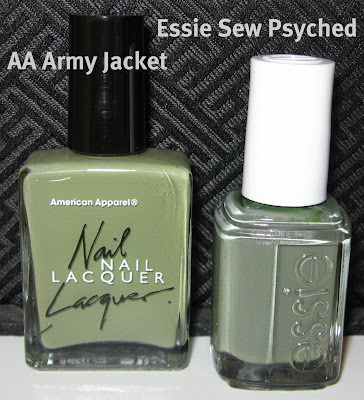 I would describe Army Jacket as a muted dusty celery with a touch of olive. What do you think of this shade? 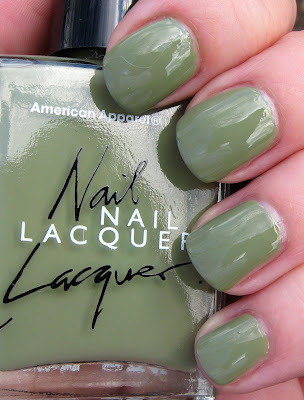 As a lover of green polishes, you know I'm loving it! edited: misscarley asked how it compares to Chanel Khaki Vert and I apologize, I should've thought to include the Chanel in my photo! I just looked and the Chanel is darker and greyer. In my opinion, Khaki Vert is more similar to the Essie. Dirty greens. I love them. I want this. I have to order this and some more! Gorgeousness in a bottle. 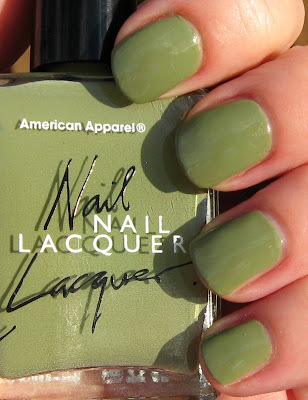 I loooooove American Apparel's nail polish and I can't wait to get my hands on some of these new colors. Their formula is incredible! Ohh I love this kind of green! 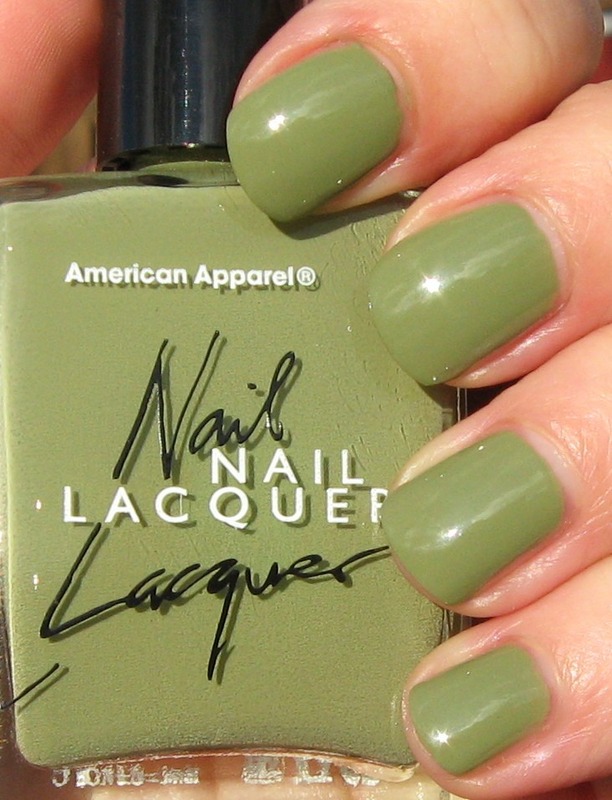 I wonder how it compares to Chanel Kakhi green..
this is an absolutely amazing shade! Oh, at first I thought I wouldn't like it, but it's so unusual, gorgeous!! I like AA better than the Essie color. Army Jacket just seems fun. I bet the AA applies much nicer than the Essie. WooHoo! I can't wait to get mine! I find it is a very interessant color !! I love this! I think I prefer it to Sew Psyched, just looking at the bottles.